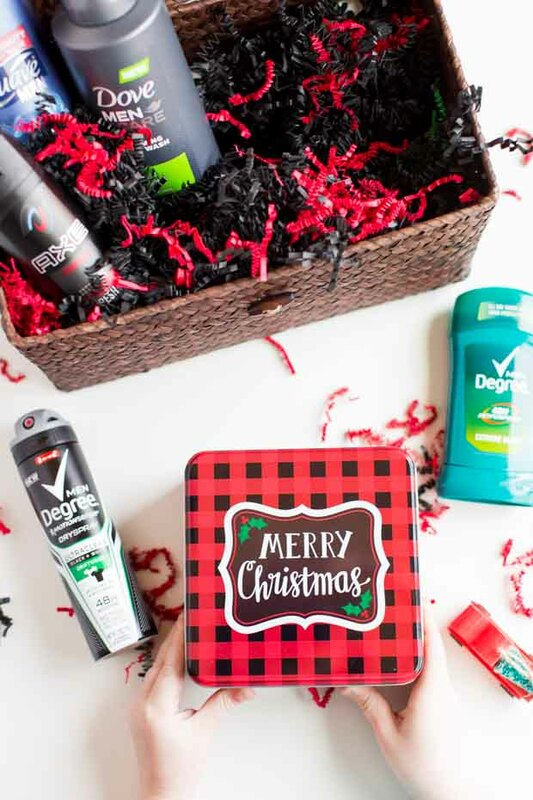 A personal care gift basket packed with goodies and yummy, homemade pumpkin cheesecake bars is the perfect way to let a special dad know you care! You’re going to want to head into the kitchen to make this amazing, homemade dessert immediately. It combines two of my favorites in a delicious and delightful new way! This simple recipe creates mouthwatering pumpkin cheesecake bars that you’ll want to devour. If you love pumpkin cheesecake, these are for you! Perfect squares offer the best flavors in a unique twist on pumpkin pie cheesecake. They’re a quick, easy dessert made from scratch will have everyone begging you for the recipe to keep. Cinnamon, spices, brown sugar, cream cheese, and pumpkin combine with a little magic to create this one-of-a-kind, old-fashioned treat. And let’s not forget the pecans! 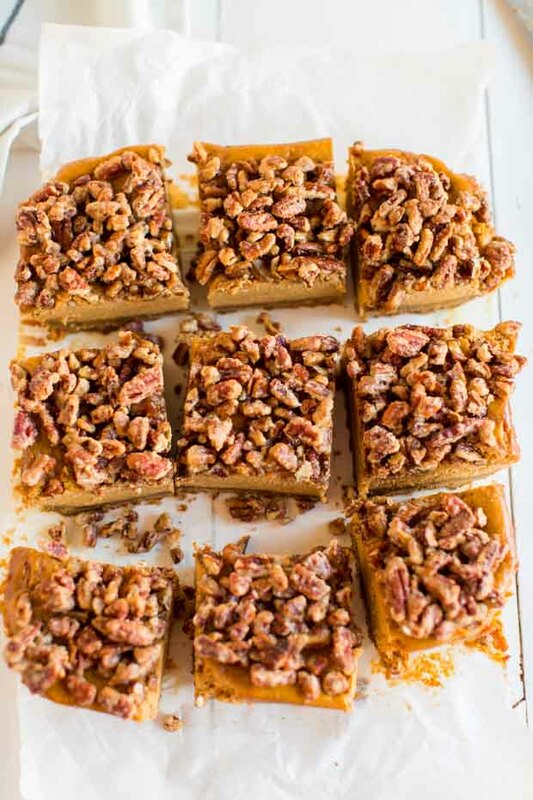 I’m obsessed with this incredible pumpkin cheesecake bars recipe! I’m proud to partner with Mirum to bring you this original idea. 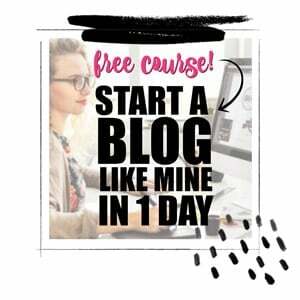 Today I’m going to take you on a little trip back through memory lane that brings us to the present day. Way back when I first met Ryan, I was very decidedly single at that time in my life. We met through mutual friends and hung out a few times in a group setting. Our first few encounters, we had great conversation and I thoroughly enjoyed him. Flash forward a year and I bumped into Ryan’s dad at an event at our church. We struck up a conversation and I asked how Ryan was doing. It wasn’t long after that when Ryan and I went on our first date. As we were dating, one of the first things that drew me to Ryan is his gentle heart and patience. My first impressions weren’t wrong — as our years together have passed, I’m more and more in love with his gentleness. It’s especially evident as he interacts with our two boys. Ryan is an excellent dad: he takes time to slow down and teach the boys things along the way, which I so appreciate. Often when I watch him with the boys, I am reminded of Ryan’s dad and his great qualities that helped shape Ryan into the man and dad he is today. With Christmas around the corner, I wanted to do something special for my father-in-law to capture how thankful we are for him. I told Ryan about my plan and he was quickly on board. We got the boys involved as well to help make it extra special. I’m excited to share our gift idea with you today plus a recipe for totally delicious pumpkin cheesecake bars! Our adventure starts at Kroger. 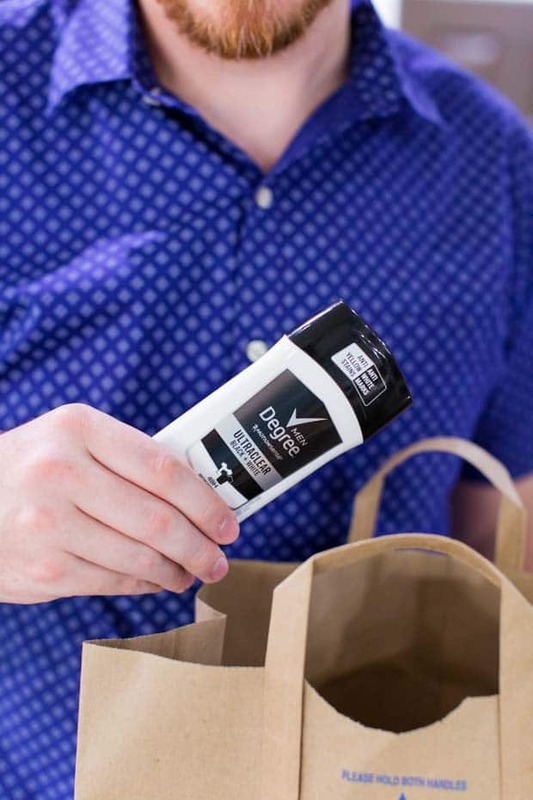 It’s the perfect place to snag all the personal care products you need at great prices. I love how convenient it is to pick up trusted men’s care that we love while doing our other shopping. While we shopped, Ryan enlisted the help of our boys to try different smells to select ones Grandpa would love best. The boy’s were especially excited with the deodorants. The boys love sneaking into Ryan’s drawer and snagging his deodorant to swipe on so they can smell like “real” men. While their excitement is precious, it makes me want to weep how fast they’re growing up. But I digress. Because of their little obsession with smelling like grown-ups, they loved picking out the deodorant best of all. 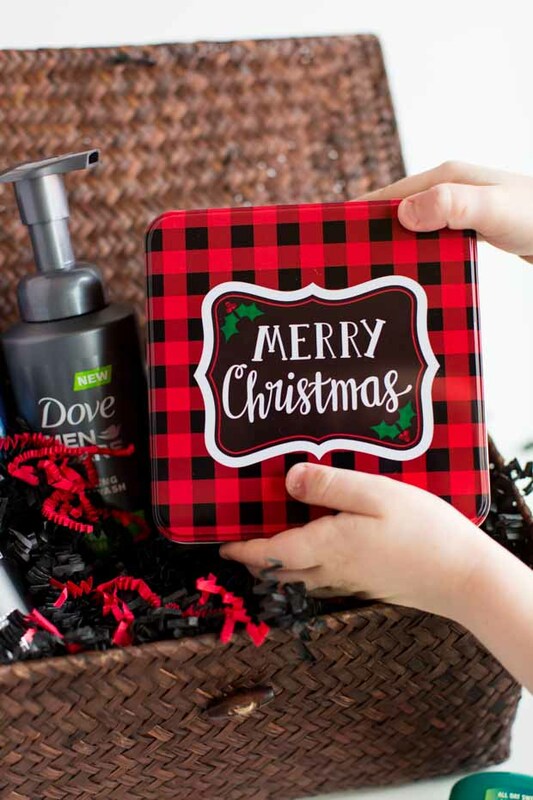 We grabbed a selection of products and then headed home to create our gift basket. I love how it turned out! I have a dark basket that I picked up that made the perfect container to hold our package. I filled it with black and red crinkle cut paper that perfectly matched the tin I picked up for our treats. 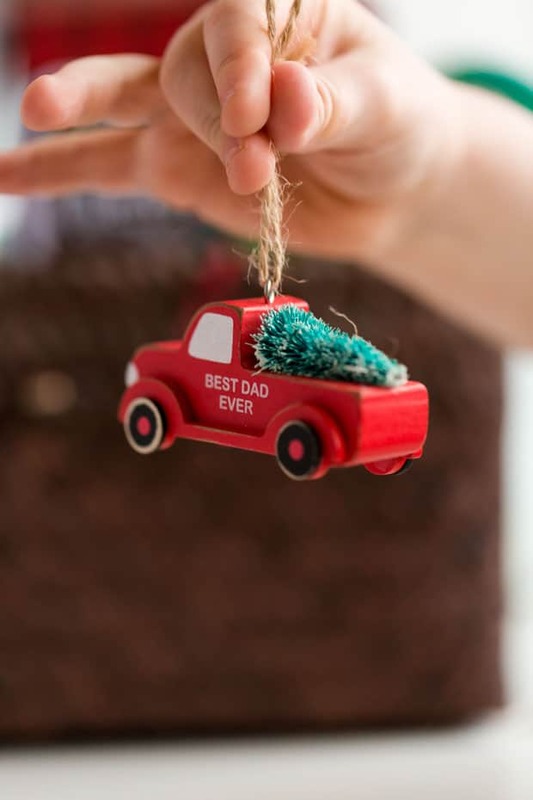 Ryan also found a “best dad ever” Christmas tree ornament that was the perfect addition to our gift. Usually, it’s the boys and I that head into the kitchen — but this time Ryan got in on the action as well. 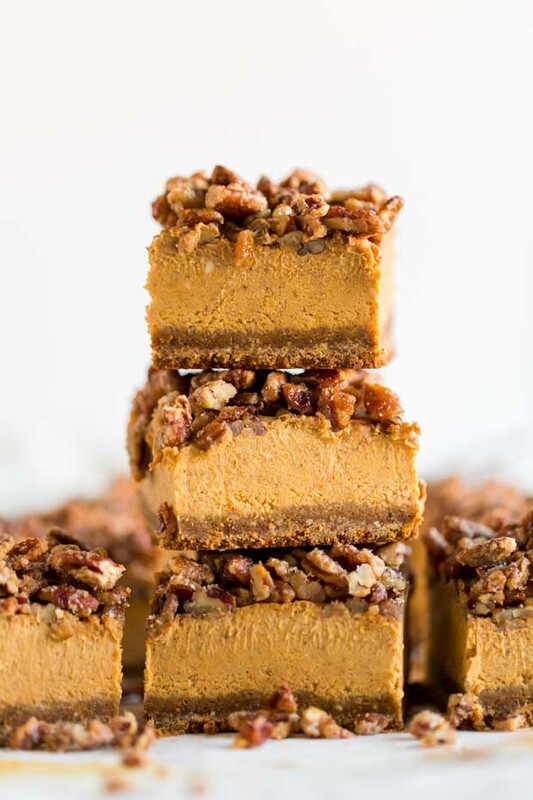 My father-in-law loves pumpkin cheesecake and pumpkin bars so I decided to combine two of his favorites into one easy recipe with these pumpkin cheesecake bars. I love pumpkin pie cheesecake as well so it wasn’t difficult to taste test this creation! 😉 I adapted my normal pumpkin cheesecake recipe to create these perfect squares that are full of great flavor! This quick, simple recipe creates an amazing pumpkin dessert from scratch that everyone will love! Preheat oven to 350 degrees. Line an 8×8 baking pan with parchment paper. Pulse together the gingersnaps crumbs, graham cracker crumbs, cinnamon, and sugar until they are fine crumbs. Add butter and pulse to blend. Press the crumbs evenly into the bottom of the pan. Bake at 350 degrees for 8-10 minutes. Allow to cool for 10 minutes. On medium speed, beat cream cheese and brown sugar until smooth and creamy. Add the pumpkin and mix on low speed until fully blended. Combine the milk and vanilla, beating until well combined. Stir in the spices and salt, mixing on low. Pour onto the crust. Bake at 350 degrees for 40 minutes. Add nuts, brown sugar and water in the same bowl. Spread over the top of the pumpkin cheesecake. Remove from oven and place on a wire rack to cool to room temperature. Chill overnight. Cut into squares. Store in an airtight container in the refrigerator for up to 4 days. I’m confident anyone who tries these easy homemade pumpkin cheesecake bars will think they’re delicious! Once the bars were ready, I put them into the cute tin and nestled them into our gifting basket. I know Ryan’s dad will be so happy when he sees them! I’m so excited to give him this gift basket and remind him how much he means to all our of family and how thankful for him we are. It will be a very Merry Christmas indeed! These easy, homemade pumpkin cheesecake bars combine great flavors everyone will enjoy! Bake at 350 degrees for 8-10 minutes . Add nuts, brown sugar and water in same bowl. Remove from oven and place on a wire rack to cool to room temperature. My son love it. Wanna bake some more. Great flavors and took no time to prep these.